Delicious Low-Carb and Keto Wraps with Lettuce, Collards, or Cabbage are a perfect dinner for summer, so I’ve updated this round-up to share all my favorites! 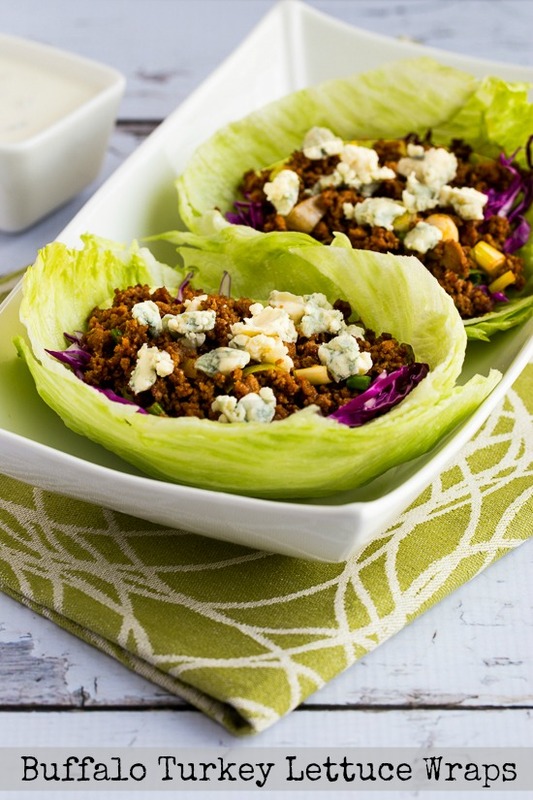 How about trying one of these low-carb lettuce wraps over the weekend? Check out Recipe Round-Ups to see other round-ups like this one. Click to PIN Low-Carb and Keto Wraps with Lettuce, Collards, and Cabbage! When you want a low-carb meal that’s quick, easy, and fun to eat, I think you can’t go wrong with low-carb lettuce wraps! And if you look through this collection of Delicious Low-Carb and Keto Wraps with Lettuce, Collards, and Cabbage it’s obvious that I love wraps with all kinds of greens on the outside; I think they’re an amazing way to create highly-flavored low carb food that still feels like a treat. I scoured the archives of Kalyn’s Kitchen to gather up all my low-carb and Keto wraps for this collection; these recipes are also gluten-free and South Beach Diet friendly and many of them can be Paleo as well. There’s even a wrap with tofu for the vegetarians! Check individual recipes to see tags showing which diets it’s suitable for. A few recipes have suggestions for how to adapt to a specific way of eating when needed. Hope you’ll find some new ideas here to try, and maybe even one or two that might become favorites at your house! Just click the recipe name under any photo to go to that recipe on the site. And I hope you enjoy trying some of my favorite low-carb and Keto wraps! 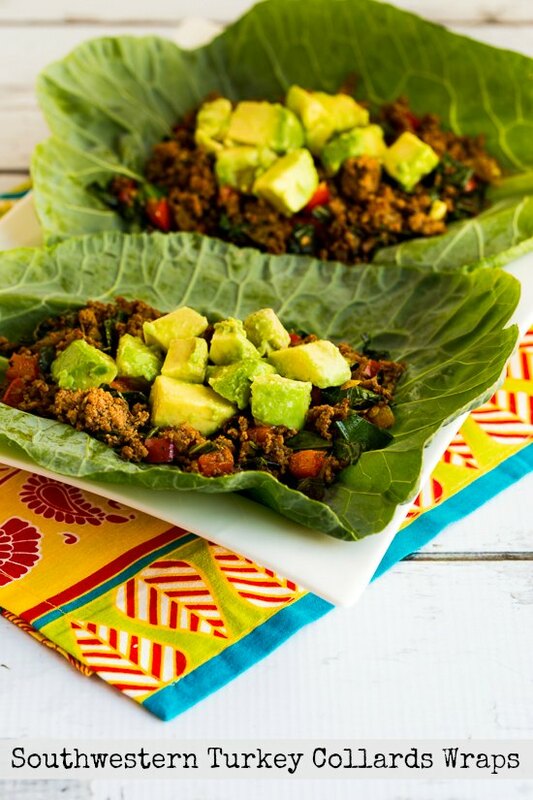 Lettuce Cups with Spicy Ground Turkey Filling were one of the first low-carb lettuce wraps recipes to show up on my blog, and they’re hugely popular in my family. Think about how slaw really goes with fish tacos and you’ll realize how this idea for Shrimp Salad Cabbage Cups was born! If cabbage just isn’t a go for you, use lettuce to make these instead. 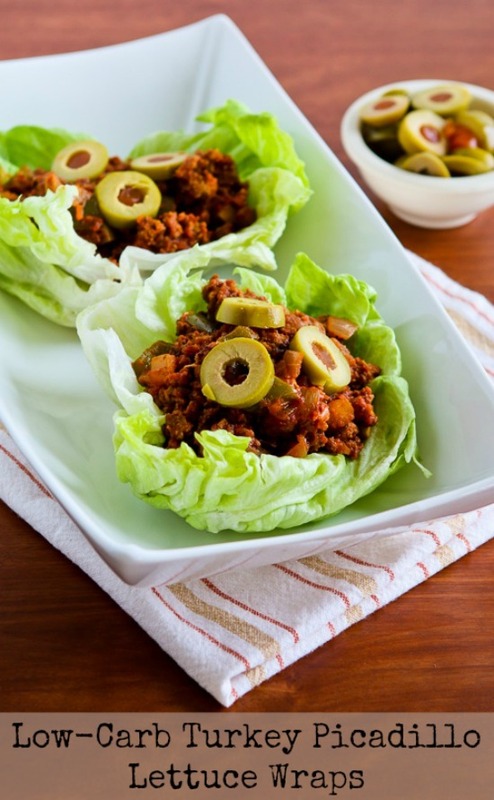 Picadillo is a type of spicy meat with green olives and I love these Low-Carb Turkey Picadillo Lettuce Wraps. If you like fish tacos, you’ll love these Lettuce Wrap Fish Tacos with Spicy Cabbage Slaw and Avocado. I know these Slow Cooker Low-Sugar Barbecued Chicken Lettuce Cups are kid-friendly because I tested the recipe on visiting nephews. Low-Carb Tuna Salad Lettuce Wraps with Capers and Tomatoes are great for a quick lunch. When I discovered Frank’s Red Hot Sauce had zero carbs I went on a buffalo sauce binge, and came up with these Buffalo Turkey Lettuce Wraps (with crumbled blue cheese, or course). I love the sweet flavors of the collard greens in these Southwestern Turkey Collards Wraps. Be open-minded if you’ve never tried collard greens for a wrap; they’re sweet and delicious! If you love Sriracha Rooster Sauce the way I do, you’ll swoon over these Low-Carb Sriracha Beef Lettuce Wraps. 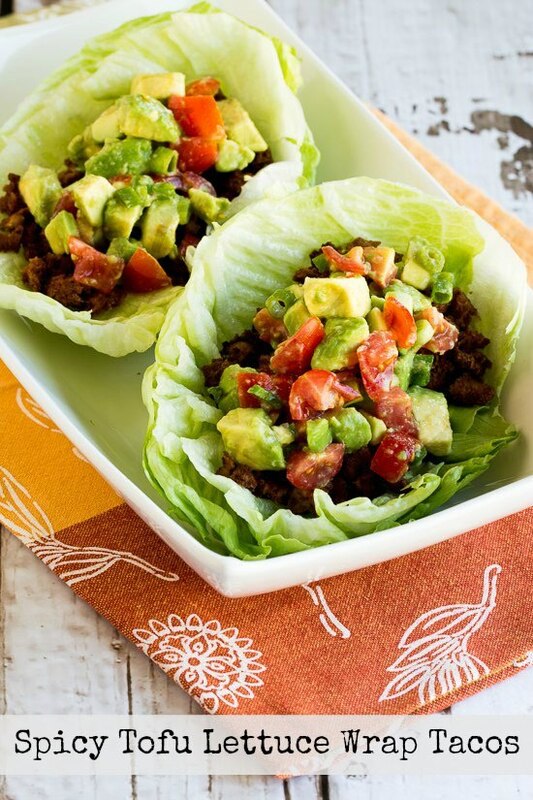 This is probably the low-carb lettuce wraps I make most often when I need something quick. 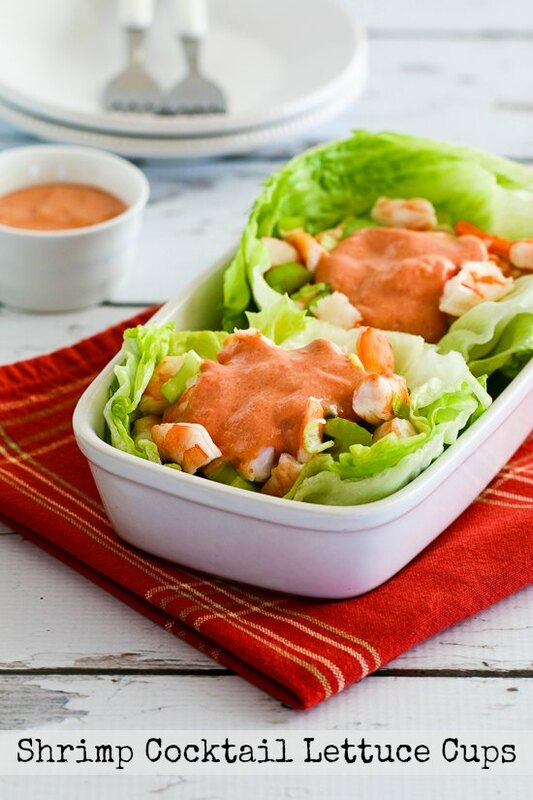 Everybody who likes shrimp cocktail will get the appeal of Shrimp Cocktail Lettuce Cups. If you like the Greek pita sandwiches called Gyros, these Ground Beef Gyro Meatball Lettuce Wraps with Tzatziki and Tomatoes are a low-carb lettuce wrap with those same Greek flavors! You can just crumble the meat and cook it if you don’t have time to make meatballs. Turkey Lettuce Wrap Tacos with Chiles, Cumin, Cilantro, Lime, and Tomato-Avocado Salsa are the first recipe idea I ever got from a conversation on Twitter. Spicy Tofu Lettuce Wrap Tacos feature a method of cooking tofu that came from my friend Donna. I love the Thai flavors in these Thai-Inspired Turkey Mini-Meatball Lettuce Wraps. 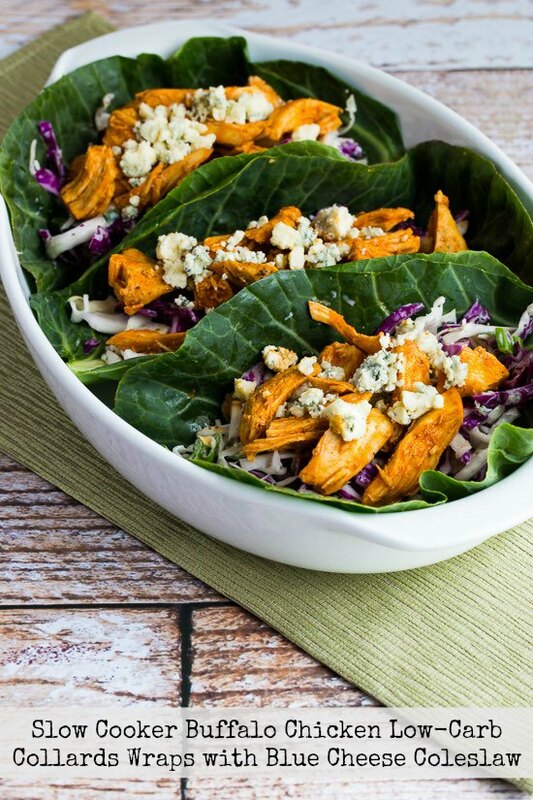 Another delicious wrap with collards greens is these Slow Cooker Buffalo Chicken Low-Carb Collards Wraps with Blue Cheese Coleslaw. 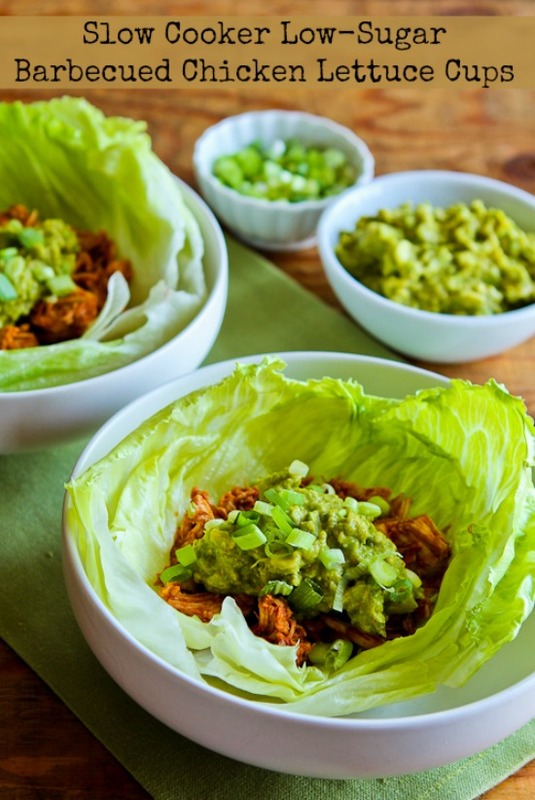 Spicy Shredded Chicken Lettuce Wrap Tacos have an avocado salsa that kicks up the flavors and these can be made in the slow cooker or the Instant Pot. It’s the sauce that creates amazing flavor in these Asian Lettuce Wraps with Pork, Napa Cabbage, and Red Bell Pepper. 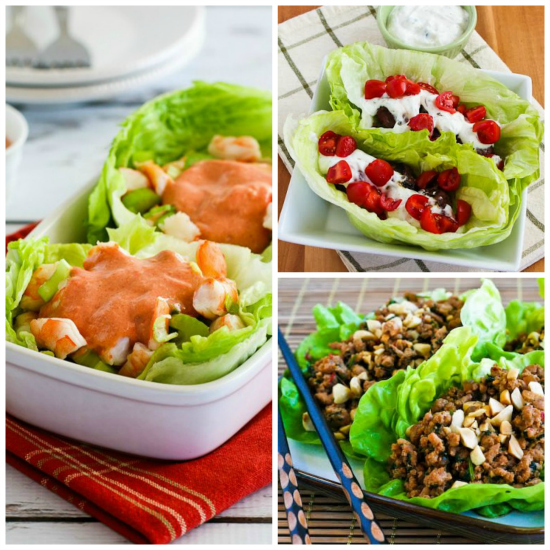 Are lettuce wraps, collards wraps, or cabbage wraps something you’d enjoy for an easy dinner to eat with your hands? If you have a good recipe idea for a wrap that’s low in carbs, let us know about it in the comments! Thanks for putting this list together, it really helps. Amy, so glad it's useful for you! These greens wraps each look delicious. Fresh, healthy,and colorful enough to liven any Super Bowl party too! Thanks Peggy; so glad you like them!